Monkey fart flavoring is a unique mouth-watering flavor derives from combination of Strawberry, Banana and Peanut Butter flavors which makes the taste outstanding. It's concentrated and must be diluted before use. Type: Monkey Fart Water Soluble Flavoring. Ingredients: Natural and Artificial Flavoring, Propylene Glycol. USP Kosher Grade Flavoring. Usage Rate: 15-20% for E-use. Flavor suitability: Suitable for shakes, smoothies and cocktails. Specific Gravity: 1.01 No Refunds on Flavoring. ordered this form a local vape shop i saw monkey fart. i was like WTF monkey fart. he's like "yea i know" so i said damn hit me up with some monkey fart lmao, and its not a bad flavor one bit. 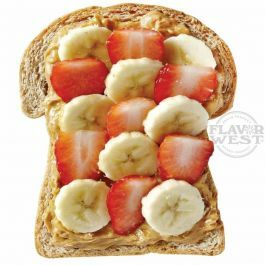 the peanut butter little over powering but in all not a bad flavor wish it was more heavy on the strawberry.